The image this work is based on arrived in my living room when I was a child. I was astonished by her at the time and she was the subject of much discussion. 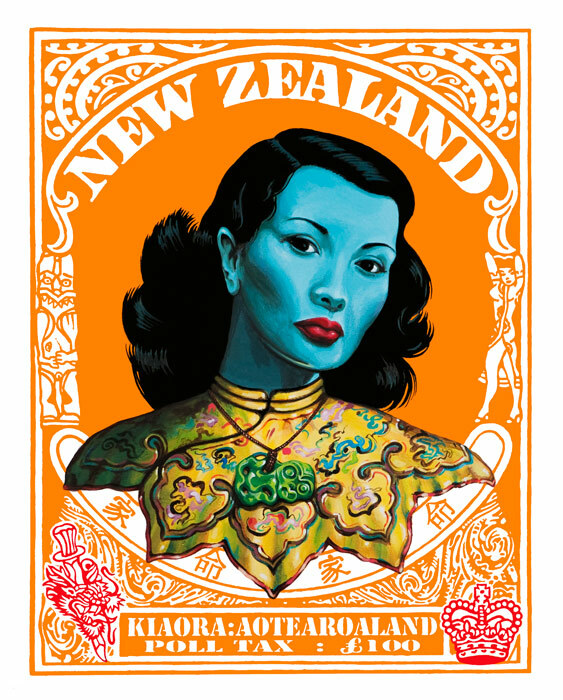 It is the most popular art print on the planet and it has won itself a place in the heart of many Kiwis as genuine Kiwiana. The place in Aotearoa of the new Chinese immigrant is often questioned. This work recognizes that Chinese were here since the beginnings of Pakeha expansion and the fact that they were racially profiled for a 100 pound "poll tax" to gain entry. This was married to a limit of one Chinese person to every 200 tons of cargo…. the tax was dropped in 1934. The original image was of a more Thai looking woman who was looking down and away from the viewer. The subject is more Chinese now and looking at the viewer but her head still carries a tilt to acknowledge the suspicion Chinese are still the subject of after many generations because of a new influx of immigrants. The dragon image references often seen tattoo motif of Chinese with daggers through their heads. The Asian lettering means home in Chinese and Japanese, because "they all look alike".